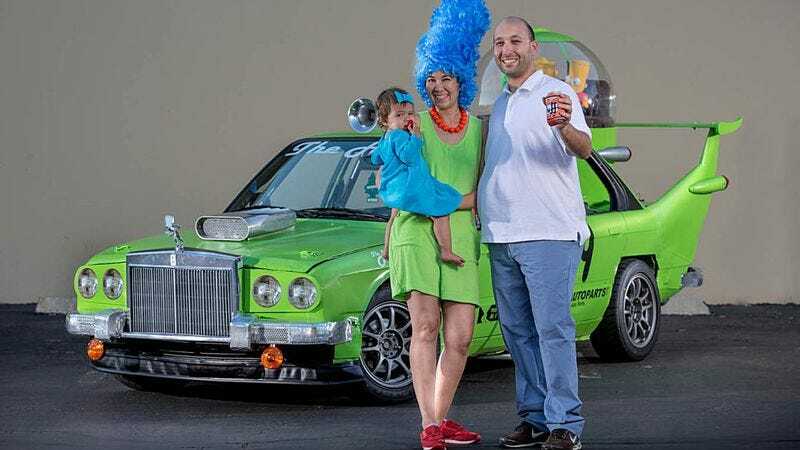 Someone finally made Homer Simpson's dream car, "The Homer"
Way, way back in season two of The Simpsons—which aired in 1991 for those who want to feel old—Homer came up with an idea for a new car, The Homer. Finally, 22 years later, someone has actually produced that car. The Homer will race this weekend during the 24 hours Of LeMons in Buttonwillow, California. As Uproxx notes, the race pits drivers of amusingly-decorated clunkers against each other to see if any of the cars will actually last long enough to drive for a full 24 hours. Porcubimmer Motors’ produced The Homer, which boasts an engine “powerful like a gorilla,” bowling trophy hood ornament, attached Squishee cup, passengers Bart and Lisa, and a BORT license plate. There’s a full photo gallery on photographer David Moore’s website, for anyone who wants to see the car in its detailed glory, or just watch the video below. Really interested parties can even track the car live as it races this weekend.